Famous as the site of the world water speed record in 1978, Blowering Dam is one of the biggest dams in NSW. At 1,628,000 megalitres or three times the size of Sydney Harbour, Blowering Dam stores water released upstream for electricity generation in the Snowy Mountains Hydro-Electric Scheme and releases it for agriculture in the Murrumbidgee Irrigation Area. 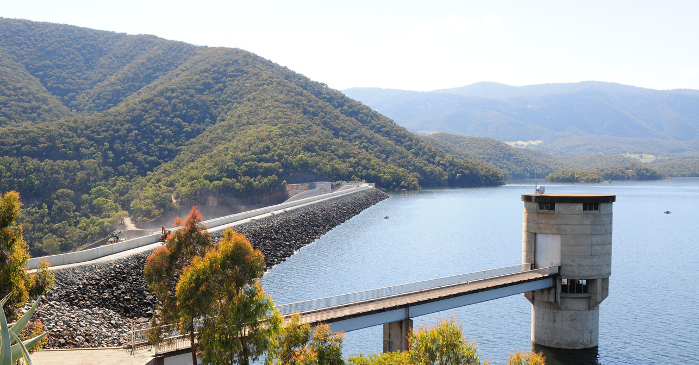 The dam also supplies water for stock and household needs for landholders and towns along the Tumut and Murrumbidgee rivers, as well as providing environmental flows, flood mitigation and hydroelectricity. The large reservoir has become a popular water sport and recreation destination. Walk across the dam wall for spectacular valley and forest views north towards Tumut and south across the reservoir fringed by the rugged bushland of Kosciuszko National Park. The dam’s rock wall is 747 metres long and 114 metres high. Enjoy changing views of Blowering Dam as this walking track climbs the hillsides above the reservoir to reach Blowering Falls. Blowering Dam is 13 kilometres south of Tumut on the southern slopes of NSW. Tumut is 410 kilometres south-west of Sydney via the Hume Highway. Stand on the dam wall and imagine a jet powered wooden boat built in a suburban backyard going faster than anyone ever has before or since. That’s what Ken Warby achieved on 8 October 1978 when he set the world water speed record of 317.6 miles per hour (511.1 kilometres per hour) on Blowering Dam in his boat the Spirit of Australia. Not only does Warby’s record still stand four decades later, the 300mph barrier has never again been beaten. The reservoir is a popular spot for all water sports including skiing, jet skis, sailing, canoeing and swimming. Several boat ramps are available at camping grounds around the lake foreshores. Blowering Dam is stocked with Murray cod, golden perch (yellow belly) and silver perch. Brown and rainbow trout, redfin, catfish, river blackfish and Macquarie perch are also present. The dam and its tributaries are closed to trout fishing between the June and October long weekends. There are open and grassy camping grounds on the northern foreshore in Kosciuszko National Park including The Pines, Yolde, Humes Crossing and Yachting Point. Each camping ground has a boat ramp, picnic tables, barbecues, toilets and carpark. Away from the water’s edge is Log Bridge camping ground, located at the start of the Blowering Falls walking track. Blowering Dam is situated on the Tumut River, about 13 kilometres upstream of Tumut on the southern slopes of NSW and 410 kilometres south-west of Sydney. It was built in the 1960s to store water released upstream for electricity generation in the Snowy Mountains Hydro-Electric Scheme and release it for agriculture in the Murrumbidgee Irrigation Area. The dam is named after a nearby property, Blowering Station. There were proposals for a dam at Blowering as early as the late 1800s, and investigations were made in 1907. But it wasn’t until the 1950s when work began on the Snowy Mountains Hydro-Electric Scheme that the plans were put into action. A dam at Blowering was needed to store water already released to generate electricity, so that it could be used to expand irrigation in the Murrumbidgee Valley and meet increasing stock and domestic needs. Water released upstream to generate electricity in winter is held in Blowering until summer when it is needed by farmers for irrigation. The extra water released into the Murrumbidgee River system opened up 95,000 hectares of irrigated agriculture on the river’s southern banks, known as the Coleambally Irrigation Area. Most of the area is made up of large farms. Rice is the main crop along with cereals, oil seeds, lucerne, grapes and fruit and vegetables. In addition to irrigated agriculture, the dam provides water for town supplies, industry and domestic requirements, environmental flows, flood mitigation and recreation, and an 80 megawatt hydroelectric power station which uses irrigation releases, environmental flows and flood mitigation. Construction began in 1964 and was finished in 1968. To meet modern dam safety standards and increase dam safety in the event of extreme flooding, an upgrade was completed in 2010. It involved construction of a parapet wall on top of the dam wall, raising the crest to its current height of 114 metres, and raising the training walls on the sides of the spillway. Storage capacity and water releases were not altered by the upgrade. Range - Consistent flows above or below 1,000 megalitres per day. Trigger - When flow increases above or below 1000 megalitres per day, or when they raise in 2,000 mega litres per day increases after that. Trigger - Flow increases of 10,000 and 15,000 megalitres per day. Trigger - Spillway flows of over 22,834 megalitres per day, last reached in 1970. Notification - Flows of over 22,834 megalitres per day are being passed, levels last reached in 1970.